Princeton just got a new way to park. You may have read about Arash Sadeghi last year in the Princeton Echo or in the Princeton Packet. The graduate of Oxford and Princeton universities was launching a tech startup to allow people to find parking in town. Using a smartphone app, users could enter details about where they were going, and be guided to an open parking space by their phone. A solar-powered ‘smart meter’ would sense when the user arrived, and begin a parking session. At the end, the user simply drives away. No more hunting for a parking spot. No more searching for quarters. It’s parking, on demand. And now, it has finally launched. When I last saw Arash, it was on Princeton University campus in the summer of 2017. At that time, he was working with a team of tech interns to perfect the 3D-printed, solar-powered ‘smart meters’ that run the ‘Possumus’ parking system. 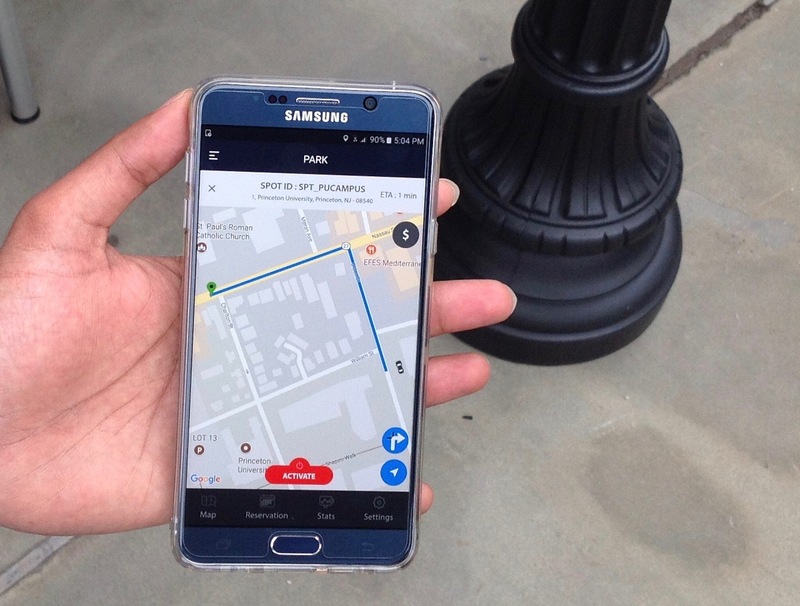 Arash and his team were excited to be launching the Possumus on-demand parking system right on the streets of Princeton, NJ. Through a deal with the town, they were being allowed to run a pilot program with 10 smart meters. But bad news hit the team. The town of Princeton reneged on their agreement to host the meters, putting the Possumus startup in serious jeopardy. Fortunately, Arash was able to strike a deal with the ‘Craft Cleaners’ dry-cleaning firm at 225 Nassau Street. Craft Cleaners doesn’t use their parking lot when the business is closed, so they agreed to let the Possumus team use it for their parking trial. That means that after 6 pm on weekdays and Saturdays, the Possumus program is available for parking at a convenient location near the many bars and restaurants of Princeton’s East Nassau St neighborhood. Last Saturday, I decided to give it a try. Starting at McCaffrey’s supermarket on North Harrison Street, I opened the Possumus ‘Park’ app, and entered an address in downtown Princeton. The ten available parking spots at Craft Cleaners showed up on the map. I clicked one to ‘reserve’ it, and turn-by-turn directions guided me there – a short 5-min drive. I pulled into the space, and the smart meter turned green, indicating that it had sensed I was there. And there, too, was Arash Sadeghi, with a luminous sign saying ‘PARK FREE’ (yes, use of the program is completely free during the trial period). He explained how he hopes the trial will demonstrate that the technology works, enabling him to expand to other businesses, and, he hopes, partner once again with the town for street parking. 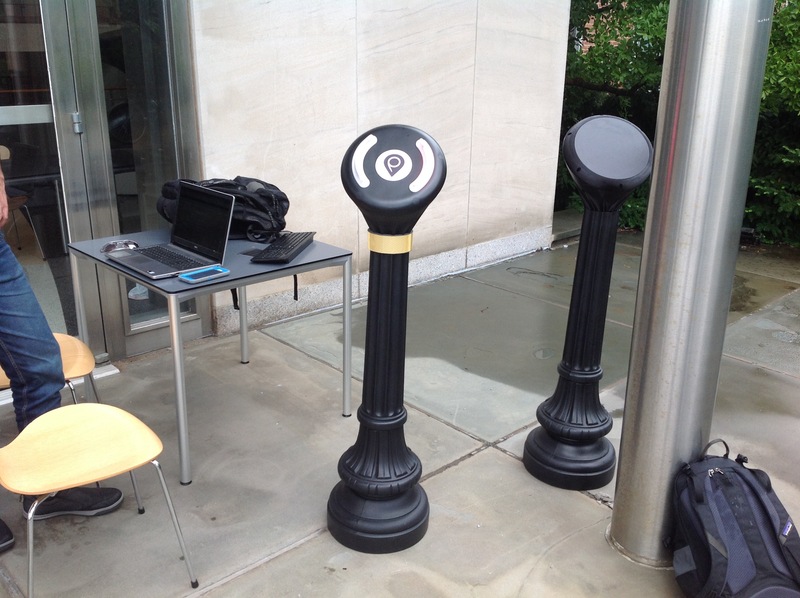 Is Possumus the future of parking in Princeton? Time will tell. The town has struggled to figure out a way to effectively manage parking, and most recently hired consultants to produce recommendations on how to make better use of available parking garages and spaces. Many potential walkable housing developments are made impossible by stringent zoning requirements for off-street parking. These kinds of issues could potentially be alleviated by an innovative program like Possumus. And if it isn’t successful, it won’t be because of a lack of effort. 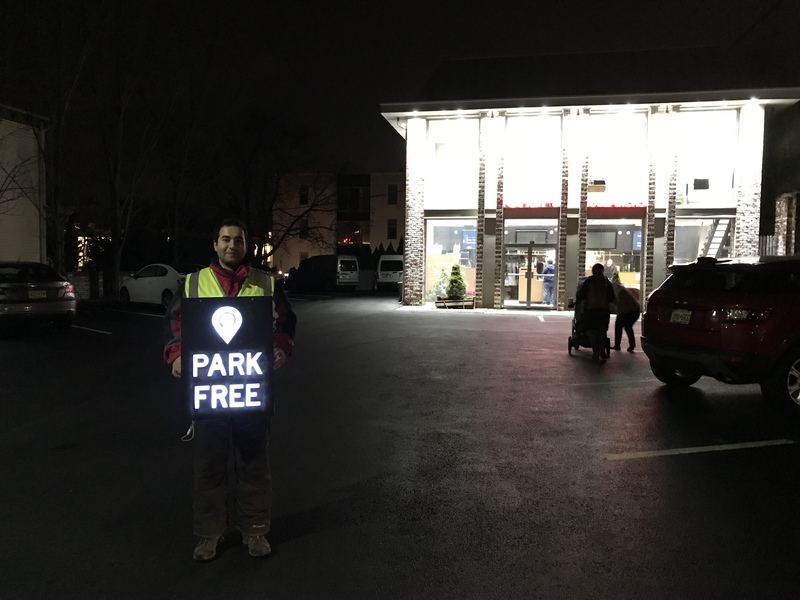 When I said goodbye to Arash on Saturday evening, he was standing in the dark, in driving snow, waving at drivers to encourage them to come check out his parking spots. He was planning to stay there, making sure the smart meters worked properly, until 11 pm. This entry was posted in People, Princeton, The Parking Question and tagged Parking, Princeton, startup, tech. Bookmark the permalink.